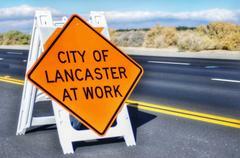 Intermittent lane closures on Lancaster Blvd., east of 40th Street East, are due to utility and street improvements at Lancaster Baptist College. The Antelope Valley Family YMCA will host its annual Turkey Trot on Thursday, November 22. While walkers will remain on the sidewalk, the traffic signal at 15th Street West and Avenue K-8 will be in flash from 8 a.m. – 9:30 a.m.
Several lane closures on Avenue L between 15th Street West and 30th Street West due to a Public Works Construction Project to repair sidewalks as well as curbs and gutters.